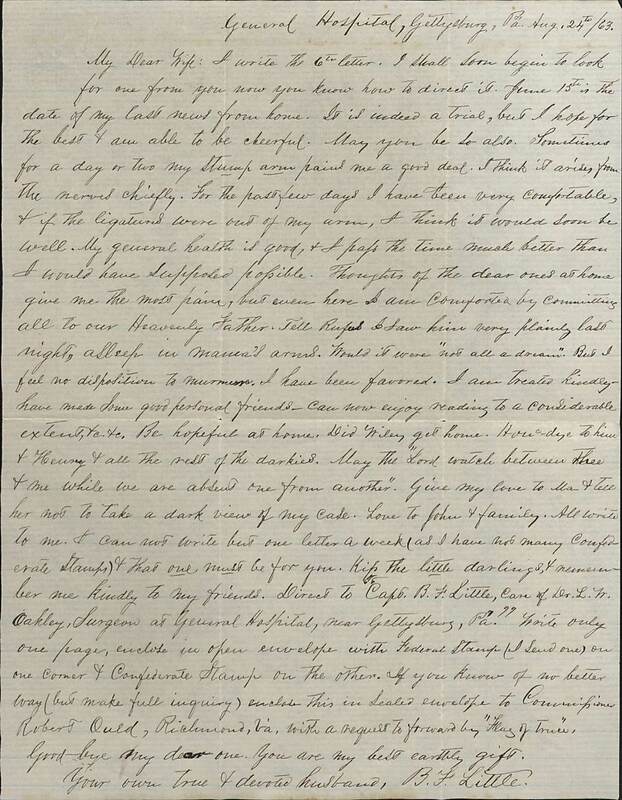 Item description: Letter, dated 24 August 1863, from Benjamin Franklin Little to his wife, Mary Jane Reid Little. He describes his recovery from an amputation in a Union hospital in Gettysburg. Item citation: From folder 6 of the Benjamin F. Little Papers #3954, Southern Historical Collection, Wilson Library, University of North Carolina at Chapel Hill. General Hospital, Gettysburg, Pa. Aug. 24/63. Goodbye my dear one. You are my best earthly gift. This entry was posted in Southern Historical Collection and tagged amputations, Benjamin Franklin Little, Gettysburg, hospital. Bookmark the permalink.